We've had an amazing season, and look forward to our upcoming shows - Showcase 2019: From the Heart on February 2nd, Festival 10 - A Treasury of 10-Minute Plays on March 30th, and our mainstage production of Honk! in July, along with our Performing Arts Youth Academy show, which will also be performed in July. Congratulations to all of our nominees, and to the entire cast and crew for both shows. It was an exciting evening at last night's 40th Annual Shellie Awards, an event founded to recognize outstanding achievement in the performing arts in the Contra Costa / Diablo Valley region. 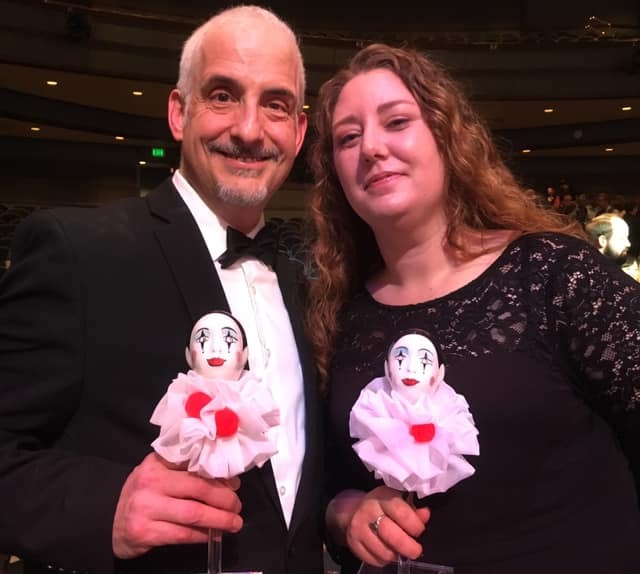 Ghostlight Theatre Ensemble was particularly proud to to be honored with the first award of the night, with a win going to Chris Finetti for "Supporting Actor in a Musical" for his hilarious and heartwarming portrayal of Sancho in Ghostlight's production of Man of La Mancha. Then, Ghostlight's General Manager, Shara Main, was recognized for her outstanding contributions to the performing arts. The audience was treated to performances from the casts of a host of nominated productions. The cast of Man of La Mancha performed The Impossible Dream, and the cast of Calendar Girls performed an iconic scene from their play.